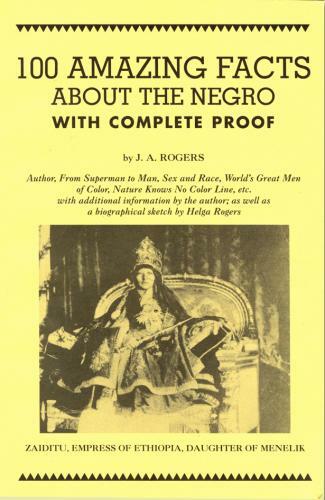 JOEL AUGUSTUS ROGERS (September 6, 1880-March 26, 1966) was a Jamaican-American author, journalist, and historian who contributed to the history of Africa and the African diaspora, especially the history of African Americans in the United States. His research spanned the academic fields of history, sociology and anthropology. He challenged prevailing ideas about race, demonstrated the connections between civilizations, and traced African achievements. He was one of the greatest popularizers of African history in the twentieth century. Rogers addresses issues such as the lack of scientific support for the idea of race, the lack of black history being told from a black person's perspective, and the fact of intermarriage and unions among peoples throughout history. A respected historian and gifted lecturer, Rogers was a close personal friend of the Harlem-based intellectual and activist Hubert Harrison. In the 1920s, Rogers worked as a journalist on the Pittsburgh Courier and the Chicago Enterprise, and he served as the first black foreign correspondent from the United States.